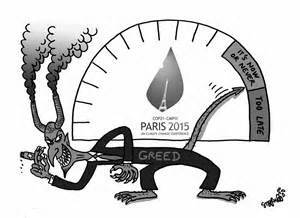 The results of the Climate Change conference in Paris (COP21) give no reason for small island states to cheer. The agreement reflects many promises and little action. The one item of concrete action is merely an undertaking to evaluate carbon emissions every five years – and even that has no teeth. What is not in the agreement is a firm, legally binding commitment to limit average global temperature increases to 1.5 degrees Celsius. Also not in the agreement is a legally binding commitment to provide developing countries with the funds needed to adapt to, and mitigate against, the effects of climate change. There isn’t even a commitment to a fund, in the sum of US$100 billion a year that was frequently touted before the conference began. Once again, the industrialized nations of the world – the worst polluters – took advantage of the weakness of the smallest countries of the world which are the least polluters and the biggest victims of climate change. To their credit, through the Alliance of Small Island States (AOSIS), representatives of small states did put up a good showing in Paris. Armed with the latest statistics and bolstered by a Structured Expert report released by the UN Framework Convention on Climate Change, they argued for the containment of global warming to 1.5 degrees Celsius, showing that, at 2 degrees, destruction would be widespread and irreversible. But, in the end, despite all the hoopla, applause and celebration, small states lost. Representatives of AOSIS countries might have been flattered by a brief visit to them by US President Barack Obama, when he declared: “These nations are not the most populous nations, they don’t have big armies they have a right to dignity and sense of place.” But, while President Obama was undoubtedly sincere in what he said, he also knew, even as he was saying it, that he could not deliver ratification by the US Congress of any agreement that limited carbon emissions or bound the US legally to warming no higher than 1.5 degrees Celsius. In truth, the climate change action plans submitted by 188 countries would lead to a temperature rise as high as 2.7 degrees Celsius. And, if that is not bad enough, the signatories to the Paris agreement are under no legal obligation even to meet that objective; they are legally free to enlarge carbon emissions further. So, no cause for Small Island states to celebrate over that one, and profound reason for them to worry. At 3 degrees, the size of islands will shrink, productive areas will be under water, people will have to move habitats inland and many will be forced to migrate, legally and illegally. We have to hope that all the scientists who predict this scenario are wrong. On the money side, the developed countries declined to insert into the Paris agreement their often-made oral commitments to transfer funds to poorer countries in order to help them adapt. Yet, all the studies show that even the US$100 billion a year that was promised would not be enough to help developing countries build up a power system quickly or cheaply enough on renewable energy sources rather than coal or oil. Incidentally, even if the US$100 billion a year fund was achieved, access to it by small states in the Caribbean would be long and arduous, particularly is the criterion of “per capita” income continues to be applied as it is now by International Financial Institutions. The portion available to the Caribbean region would be a small fraction of the total sum. Some may argue that there are two aspects of the Paris agreement that are beneficial to small states. Therefore, attention should be paid to them. The participating countries recognized “the importance of averting, minimizing and addressing loss and damage associated with the adverse effects of climate change, including weather events and slow onset events”. But, liability is completely ignored because it was opposed by the polluting industrialized countries. Recognition of a problem is far removed from committing to action to cure it. Then there is the single binding legal requirement in the agreement. Every country is now required to come back every 5 years with new targets for reducing their carbon emissions. But there is no sanction if they failed to meet their previous commitment and no sanction if they simply carry on business as usual. COP21 in Paris may have been a triumph for some nations, but no self-respecting small island state should claim any satisfaction. That is why, each small state individually and within the many organizations in which they are members, including AOSIS, the Commonwealth, La Francophonie, the Organization of American States and others must now redouble their efforts to work on the developed country governments, but also to move beyond them to the conscience of the people of the industrialized world. This is about survival and development – two defining challenges of this Century for small states. It is the work of everyone – governments, businesses and civil society. All are involved and all could be consumed.